Homebrewing terminology can be a language of it’s own if you’re just getting started. When I received my beginner homebrew kit, I took the time to read the little booklet that came with the kit multiple times. I also found myself doing multiple Google searches on “how to brew beer” to understand the process a bit better. That’s when I started to run into trouble. I came across terms in forums that seemed like a foreign language to me. Words like mashing, gravity, and my favorite – pitching yeast. What the hell did I get myself into? All I wanted to do was brew a beer, and now I had to decipher what all these terms mean. Hopefully I can shed some light on the homebrewing terminology that confounded me. Let’s get right into it – homebrewing terminology translated with my simple definition. This isn’t meant to be an all inclusive list of every homebrewing term known to man. These are the terms that tripped me up as I started my research into homebrewing. Air Lock: A small device used during fermentation that allows carbon dioxide to escape from the vessel while keeping contaminants out. All Grain Brewing: A brewing process that only uses grains, not malt extract. This gives the brewer more control over taste and color of the finished beer. Bottle Condition: A process where fermented beer is stored in bottles to both carbonate and allow to age (or condition). This typically takes anywhere from 2 – 4 weeks. Dry Hop: While most hops are added throughout the boil, dry hopping adds hops to either the primary or secondary fermentor. This allows flavor and aroma to be extracted from the hop, while limiting bitterness. Efficiency: Is simply the effectiveness of your all grain brewing process, typically measured as brewhouse efficiency. This is expressed as a percentage, and shows how efficient you are with extracting sugars from the grain. A number of brewers are obsessed with increasing their efficiency numbers, but in reality you should be content with your number as long as you are being consistent. Extract Brewing: A brewing process that only uses malt extract and some speciality grains to add flavor. Considered the easiest beer to make as you don’t need to mash grain to extract the sugars. Final Gravity: See Gravity. Final gravity is the gravity reading of your finished beer after fermentation completes. Also known as Terminal Gravity. Flocculating: The ability of yeast to clump together and settle to the bottom of the fermenter. Expressed as low, medium, or high. A low flocculating yeast will stay in suspension and create a cloudier looking beer. Gravity: This one took me a bit to grasp. Gravity is the measurement of the density of your wort / beer in comparison to water. Pure distilled water has a gravity reading of 1.000. If sugar is dissolved in water, as it is when you make beer, that water becomes more dense. The gravity reading goes exponentially higher with the more sugar that’s extracted. By comparing your Original Gravity (OG) to your Final Gravity (FG), you can determine the alcohol content of your beer. Hop Pellets: Nothing more then hops that have been pelletized for use in brewing. This is what most home brewers use when making beer. 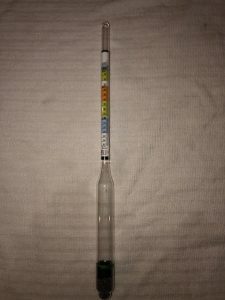 Hydrometer: An instrument that takes a gravity reading. A hydrometer is calibrated with small weights and has a number scale printed along it’s neck. By reading the number printed on the scale, you can determine your gravity reading. IBU’s: Short for International Bitterness Unit’s. This is a measure of the bitterness extracted from hops that are added to the boil. The higher the IBU number, the more bitterness found in the beer. Irish Moss: Considered a fining agent, something that helps clarify your beer. Irish Moss is added to the boil in the last 10 – 15 minutes, and helps attract particles in the wort so they settle to the bottom of your kettle. See Trub. Kraeusen: Pronounced kroy-zen, or really however you want to say it. The sickly looking gunk that forms on top of the wort during a certain phase of fermentation. During the later stages of fermentation, the kraeusen settles back into the beer and all but disappears. Lauter: A term used in all grain brewing. It’s the process of separating the sweet wort from the grain. Or in simpler terms, taking the liquid from mash tun after conversion has taken place. Lovibond: Homebrewing terminology used to describe the color of grains which will determine the final color of your beer. Also referred to as “love”. Malt Extract: The key ingredient used in extract brewing, and can be found in either liquid or dry powder form. Can also be expressed as DME (Dry Malt Extract) or LME (Liquid Malt Extract). Malt extract is the process of mashing grains to extract the sweet wort, and processing that in either liquid or dry form for purchase. This saves you from having to do your own mash. Mash: The process of soaking grains in warm water to convert the starches found in those grain to sugars. Original Gravity: See Gravity. Original gravity (OG) is the gravity reading of your wort prior to fermentation. Partial Mash Brewing: A brewing process that uses a combination of grains and malt extract. It’s a blend of extract and all grain brewing. The advantage over all grain brewing is you use less grains, and make up for the sugar difference by adding malt extract to the boil. Pitching Yeast: My all time favorite brewing term. Why not just say sprinkle or pour your yeast into your wort? Primary Fermenter: A vessel, usually a bucket or carboy, where the wort is collected after the boil and has yeast added to it. The primary fermenter is where the conversion to alcohol takes place. Racking: Simply moving wort or beer from one vessel to another using a siphon. You rack the beer from the primary to the secondary fermenter, or from the fermenter to the bottling bucket. Secondary Fermenter: A vessel that is used after primary fermentation has completed. Some will use a secondary fermenter to further condition their beer for clarity. This is a completely optional step, and many brewers feel that a secondary fermenter is not needed. The term fermenter is a bit of a misnomer, as fermentation typically doesn’t take place in this vessel, it should have been completed in your primary fermenter. Sparge: Homebrewing terminology used in all grain brewing. The action of rinsing the grains, after the sweet wort is collected, with additional water to extract as much sugar as possible from those grains. Trub: Pronounced trube. This is the garbage or gunk that forms at the bottom of the kettle after boil completes. You want to avoid this being added to the fermenter. Vorlauf: Homebrewing terminology used in all grain brewing. This is the action of collecting sweet wort from the mash and recirculating it back into the mash tun. This action helps clear up an grain debris that makes into into the wort, and helps settle the grain bed. Wort: The result of boiling the extract or liquor from the mash along with hops produces wort (pronounced wert). The wort when fermented with yeast produces beer. Many like to say, brewers create wort, yeast creates beer. Yeast: A single cell organism that will convert sugars into alcohol and carbon dioxide. There are many different strains of yeast that are used to produce different types of beers. Wyeast is a well known producer of yeast strains, and has a number of strains available that you can purchase from just about any homebrew store. Yeast Cake: The gunk at the bottom of the fermenter after fermentation completes is known as the yeast cake. This is a result of yeast settling (or flocculating) to the bottom of the vessel. Any other homebrewing terminology that tripped you up when you first started brewing? Share your thoughts below, and if I missed any key homebrewing terms, I’ll add them to my list.